Vegeta NATUR is a result of an excellent cooperation with nature and modern technology. The secret is in a huge amount of vegetables: for one packaging (300g) of Vegeta Natur 900 g of fresh vegetables was used. The product contains no flavour enhancers, aromas or artificial colours. Great combination of vegetables and spices provide the fabulours full taste! You are going to like it - it's a totally natural reaction to Vegeta NATUR. 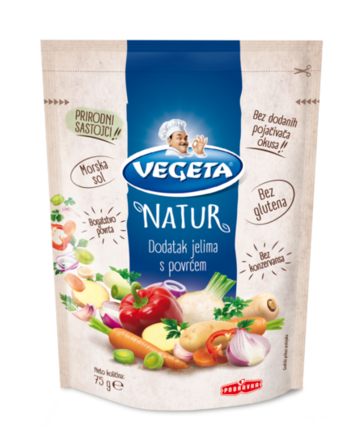 during cooking or roasting spice up the meal with Vegeta Natur. A teaspoon (3 g) is sufficient for 250 ml soup, sauce, salad, rice or pasta. Meat and fish sprinkle abundantly on both sides. No additional salt is needed. Table salt, dried vegetables 30% (carrots, parsnips, onions, potatoes, celery, leeks, peppers, parsley leaf, garlic), sugar, yeast extract, spices (black pepper, turmeric, dill).